This manifold is a new replacement for the Perkins Marine Exhaust Manifold part number ZZ90054. Call for special low price. We can supply the necessary gaskets if required. We can supply the necessary end plates if required. We also carry a large selection of exhaust elbows and mixer elbows as fitted to most Perkins engines. 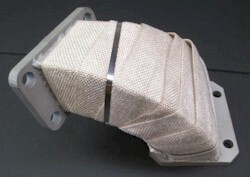 Please visit our Exhaust Elbows Page for visual identification. These units are stainless steel and offered at a great savings. 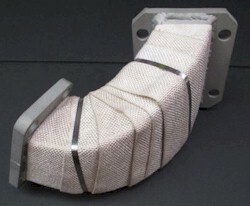 This Intercooler replaces Perkins Part Number 2486830. This unit is offered at a substantial savings. Fabricated Stainless Steel turbo mounting adaptor to replace water cooled original unit # 37766601 for HT6.354 which is NLA. Pictured here.